Over the past few months, Iran has greatly extended its foothold on Syrian territory by creating a sizeable military presence, also close to the Israeli border. These Iranian bases, with their personal and military equipment are part of an Iranian agenda, which is clearly aimed against Israel and creates a virtual Iranian border with Israel, Valdai Club expert Shlomo Avineri writes. One of the major strategic decisions made by Israel in the last decade was not to be sucked into the complex brutal civil war in Syria – a decision supported even by those in the country who have disagreed with Prime Minister Benjamin Netanyahu’s policies regarding the Palestinians. While the Assad regime remained one of Israel’s staunchest enemies, the continuation of his rule guaranteed a measure of stability on the country’s northern border. 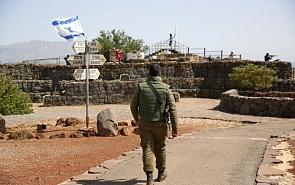 Some humanitarian assistance was extended to the Syrian civilian population close to the border on the Golan Heights, but this was done on a limited scale, as Israelis were well aware of how they got drawn into the Lebanese civil war in the 1980s and nobody wanted to repeat this experience. This restraint became the context, which enabled tactical understanding regarding Syria between Israel and Russia, who created for the first time a “hot line” between their militaries, especially between the air forces. Israelis understood the Russian geopolitical commitment to avoid Syria falling into the hands of the fundamentalist Islamic State, and Russians understood, albeit reluctantly, the Israeli insistence of preventing Iranian strategic arms deliveries to Hezbollah in Lebanon. That Russia was cooperating with Iran in Syria caused some unease in Israel, but the joint Russian and Israeli interest in preventing ISIS from toppling the Assad regime took precedence. This has now changed with the relative stabilization of the Assad regime. It became clear to Israel that the Iranian presence in Syria goes beyond guaranteeing the survival of the Assad regime and preventing total chaos in Syria. Over the past few months, Iran has greatly extended its foothold on Syrian territory by creating a sizeable military presence, also close to the Israeli border on the Golan Heights. These Iranian bases, with their personal and military equipment are part of an Iranian agenda, which has nothing to do with the civil war (which is now in many respects over), but is clearly aimed against Israel and creates a virtual Iranian border with Israel. For decades, Israel has been subjected to radical rhetoric against its very existence coming sometimes from the highest quarters of the government in Teheran. Iranian attempts towards a nuclear option have consequently been at the center of Israel’s strategic thinking, and it is for these reasons that the Netanyahu government has seen the Iranian nuclear deal as problematic and not totally closing the door for Iran to develop nuclear weapons. But this is a long-term threat: Iranian military bases in Syria, close to Israel, manned by Shia volunteers from different countries, supplied with long-range sophisticated missiles which can reach any target in Israel, are totally unacceptable strategically for Israel, especially if combined with the missiles arsenal already in possession of Hezbollah in southern Lebanon. Israel may not be able to determine the future of what is left of the nuclear deal with Iran: this is left to the five remaining signatories. Yet the issue of Iranian territorial presence in Syria is an issue which needs to be seriously discussed in the near future between Russia an Israel. While Israel cannot interfere in other aspects of Iranian-Russian understanding, including the future of Iranian nuclear development, there is no reason to think that Russia and Israel, which have cooperated successfully on Syria in the last year, are in an extremely complex situation.